Fertility Drugs, Not IVF, Are Top Cause Of Multiple Births : Shots - Health News For years doctors have been telling women that it's risky to implant multiple embryos when they do in vitro fertilization. They've listened, and the number of multiples from IVF has dropped. But the number of births of triplets or more has barely budged because of women's use of fertility drugs. An education campaign has reduced the number of high-order multiple births due to in vitro fertilization, but more are now due to fertility drugs alone. Drugs that help women become pregnant have replaced in vitro fertilization as the main culprit behind high-risk multiple births, according to a study looking at births of triplets and higher-order multiples. "IVF, which is usually the one we tend to point fingers at, was not the leading culprit," says Eli Adashi, a professor of obstetrics and gynecology at Brown University who was senior author of the study, published Wednesday in the New England Journal of Medicine. The number of multiple births of triplets or more due to fertility drugs like clomiphene citrate and injectable hormones rose from 36 percent to 45 percent from 1998 to 2011. 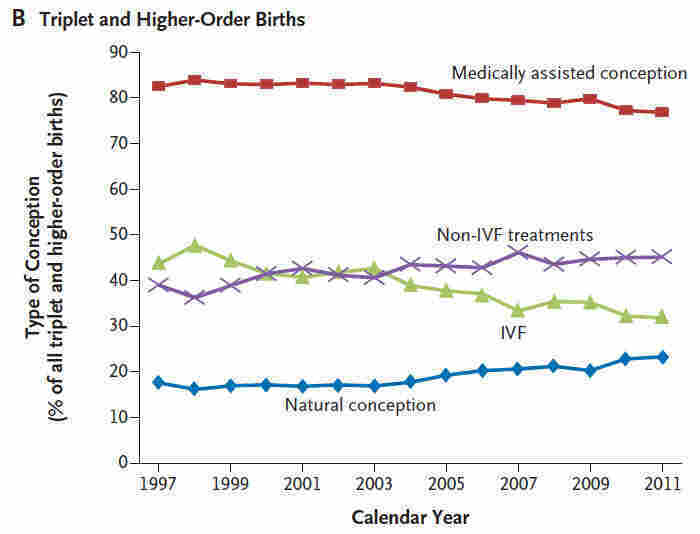 At the same time, the births of multiples because of IVF dropped from 48 percent to 32 percent. Having more than one baby at a time increases the risk for both mother and children, including premature birth, cerebral palsy and developmental delays. Between 1971 and 2011, the proportion of multiple births doubled in the United States, the study finds, from 1.8 percent to 3.5 percent. Almost all of that was due to fertility treatments. Back in the 1990s, it became increasingly clear that transferring multiple embryos for IVF was boosting the number of high-risk multiple pregnancies. Since 1998, doctors have discouraged women from transferring more than two embryos at a time for IVF. More recently, improved IVF techniques have made it more likely to achieve a successful single birth by choosing to transfer just one embryo. That is credited with lowering the numbers of high-order multiples by 29 percent from 1998 to 2011. That's good news for babies and moms. But based on this new information, it looks like the education campaign needs to expand to include non-IVF fertility treatments, too. Fertility drugs are cheaper and easier to use than IVF, and are often covered by insurance. Clomiphene citrate is a pill, and hormones called gonadotropins can be injected at home. The drugs stimulate the ovaries to produce more than one egg in a cycle. "You certainly have less control" over the potential number of eggs with fertility drugs compared to IVF, Adashi tells Shots. But fertility specialists already have guidelines that help reduce that risk. Clearly not all doctors who prescribe the drugs are following the advice, Adashi says. "Using lower doses of drugs will go a long way toward reducing the number of multiples." IVF births are tracked in a national registry, but there's no registry for births from fertility drugs alone. So the researchers did some math, taking the number of multiple births, subtracting IVF births, and then adjusting for the fact that women are having babies when they're older.